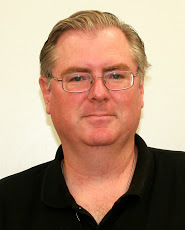 IrishAmericanJournal.com: What Were the Penal Laws? 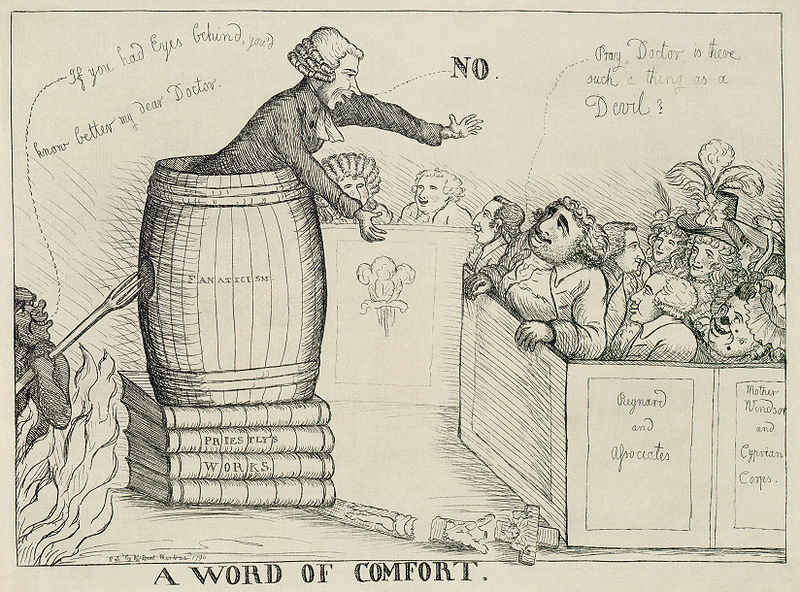 "justice" in the 19th century? Who remembers? Were you taught about this in school? If you live in Ireland, perhaps someone told you about this. But if you live in the United States, where most people who are of Irish descent live today, you probably did not learn this in school, unless you deliberately took a special course in Irish history. The Penal Laws were blatantly brutal and discriminatory laws which targeted primarily Irish Catholics. 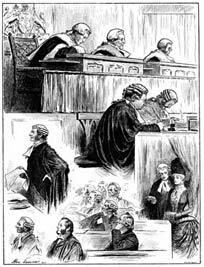 To some extent the laws also persecuted non-Anglican Protestants like Scots Irish Presbyterians (also called Dissenters) and members of other religions such as Judaism. The Anglican Church was officially sanctioned and supported by the British government and included the Church of England and the related Church of Ireland. But Roman Catholics were deprived of all fundamental human rights under the Penal Laws. In this sense the Penal Laws were comparable to the Apartheid laws in South Africa or the anti-Semitic Nuremberg Laws in Nazi Germany. The focus of oppression, however, was on religion not race. 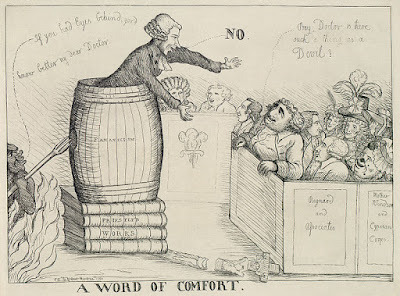 All people who are interested in the cause of justice, whether Irish or not, should want to learn about these prejudicial Penal Laws which existed in the 17th, 18th, and 19th centuries in British-controlled Ireland. Yes, people should want to learn about them for the sake of learning history. But they should also want to learn about the evils of the Penal Laws so that such a persecution of a select group never happens again -- to anyone, anywhere. It is noteworthy that the United States Constitution in addition to its safeguard of freedom of religion in the First Amendment, specifically outlaws the persecution of a select group of people without due process of law under the legal term "bill of attainder." The American Founding Fathers understood what British tyranny was too. See Article I, secs. 9 and 10 of the US Constitution which forbid bills of attainder. Protestant rule in Ireland for centuries to come. 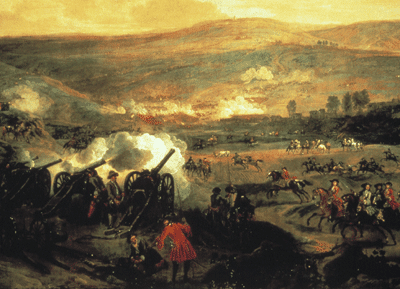 The last time two rival English kings fought each other for the crown of Great Britain was at the Battle of the Boyne, a river north of Dublin in Ireland, in 1690. This battle was part of a larger power struggle over control of Britain where religion, Catholic versus Protestant, was a key factor. The Catholic English king, James II lost the battle to the Protestant English king, William of Orange, who was really Dutch and not English. William and his wife Mary would then rule over the British Isles including Ireland. The Treaty of Limerick which ended this so-called Williamite War was supposed to guarantee equal rights for Catholics; but as time passed, those protections disappeared. The victorious group, eventually known as the Protestant Ascendancy, wanted to make certain that it remained in a position of power and privilege and that any opposition, mainly from Catholics, never again threatened their status. So, a series of discriminatory laws were passed by the pro-British and Protestant Irish parliament to suppress Catholics in Ireland, a land where the vast majority of the populace was in fact Catholic. Ever since the Reformation and the rule of Henry VIII, Great Britain feared powerful foreign countries which were predominately Catholic, such as France and Spain. Britain historically feared that foreign Catholic nations might attack British interests directly and might aid Irish Catholic rebels who resisted British rule in Ireland. When did the Penal Laws begin in Ireland, we might ask. The answer is rather complicated. There had been anti-Catholic Penal Laws prior to 1691 in the British Isles, which included Ireland then. Indeed, some discriminatory laws began from the time of Henry VIII. Certainly during the time of Oliver Cromwell, Catholics in Ireland were brutally persecuted. But the time period after the Williamite War and the Battle of the Boyne saw anti-Catholic Penal Laws which were much more inclusive, permanent, and harsh. In fact, it could be argued that the discrimination against Catholics did not fully end in Ireland until the Irish won their partial independence in the 1920s, although the North (Ulster) remained under British control. 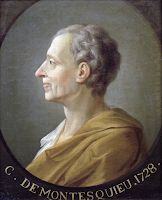 Catholics could not hold public office, i.e. be elected as a member of government. 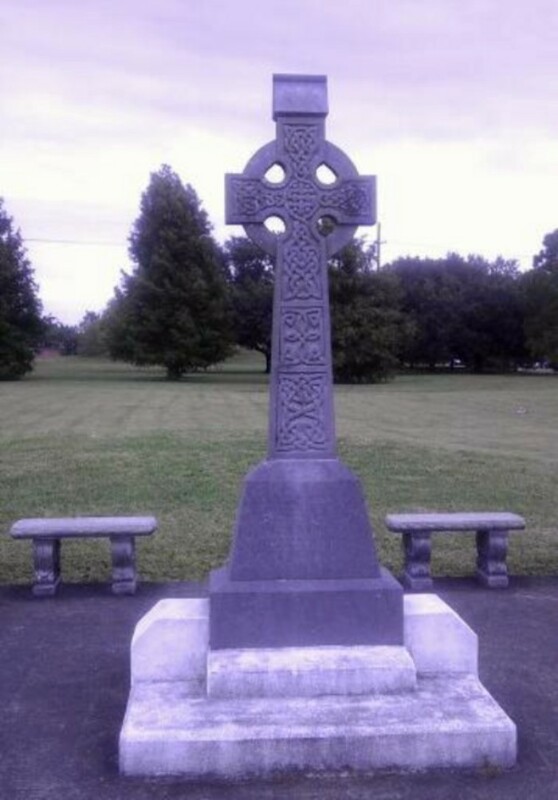 Irish Catholics could not practice their own religion. Catholics could not be educated in schools. Catholics could not become part of a profession, like being a doctor or a lawyer. Catholics were limited in what trade or commerce they could engage in. Catholics could not buy or sell land. They also could not lease land. Catholics could not own a horse over the price of five pounds. Catholics could not keep and bear arms. Catholics could not own a gun, a sword, or any type of weapon. 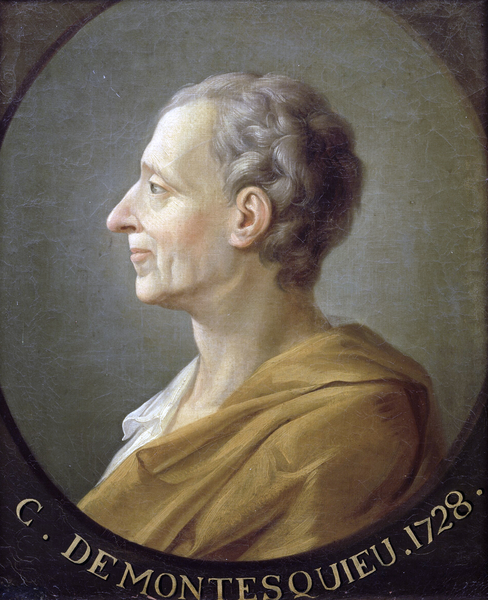 Catholics could not have an annuity, and they were limited in undertaking financial matters. A Catholic could not legally marry a Protestant. Any offspring from such a relationship had to be raised as Protestant. Catholics were not allowed to educate their children by themselves or send them to another Catholic to teach them. And there were many other restrictions. Violations of these laws could result in severe penalties including prison, torture, or death. The Irish sometimes clandestinely broke these terrible laws by having "hedge teachers" or "hedge school masters" who taught children while hiding behind trees or large hedgerow plants. Catholic religious services were also held in secret behind hedgerows or anywhere the British soldiers or officials could not find them. 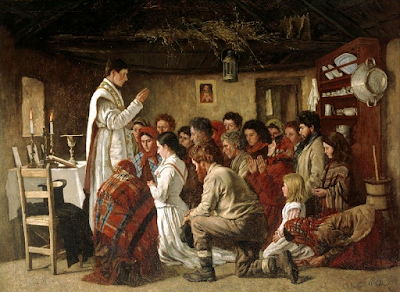 Catholic priest saying a Mass in secret in Ireland. 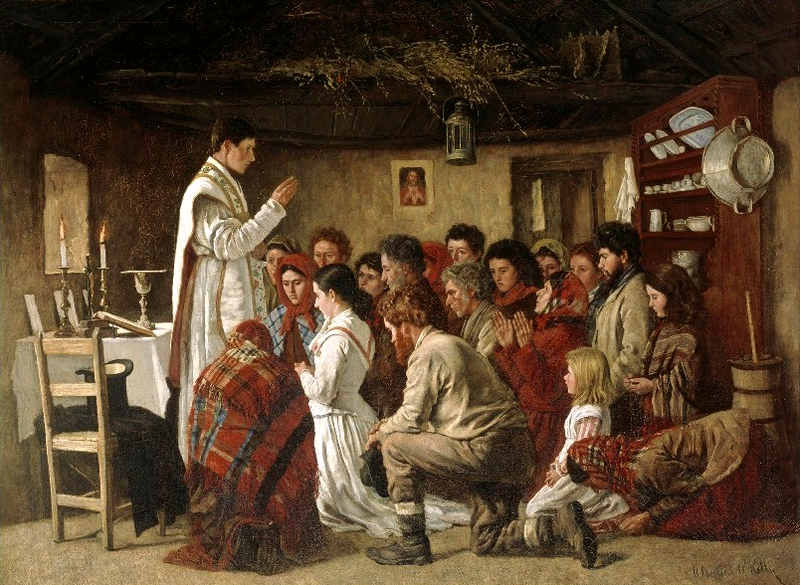 "Mass in a Connemara Cabin"
A certain type of very small rosary called a Penal Law Rosary was devised which could be quickly hidden in case the British police came by. The Irish, thereby, attempted many ways to circumvent these unjust laws and follow their own religious faith. The political statesman and philosopher Edmund Burke said of the Penal Laws, "... there was not a single right of nature or benefit of society which had not been either totally taken away, or considerably impaired." 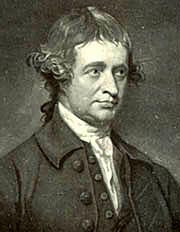 Edmund Burke became famous as an Anglo-Irish member of the British parliament who was overtly sympathetic to the American cause during the American Revolutionary War, supporting colonists' rights but opposing American independence. He also supported Catholic Emancipation or Catholic rights in Ireland. See Edmund Burke. Edmund Burke went on to say about the Penal Laws imposed on the Irish, "a machine of wise and elaborate contrivance, as well fitted for the oppression, impoverishment, and degradation of a people, and the debasement in them of human nature itself, as ever proceeded from the perverted ingenuity of man ..."
There was a legal scholar from France named Montesquieu who lived in the early 18th century, during the time of the Penal Laws. He is noted for advancing the concept of "Separation of Powers," where no one person or part of the government has absolute power. We see this principle in the US Constitution where we have equal powers among the executive, legislative, and judicial branches. It is a device to prevent tyranny, an evil with which he was gravely concerned. We should all learn more about the Penal Laws if we are interested in Irish history. 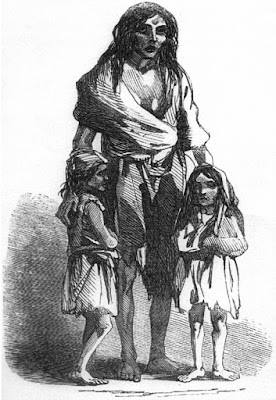 They happened long ago, but they had profound affects on the people of Ireland to this day and on the Irish who sailed away to America long ago. The horrible story of the Penal Laws, however, is not just for a study of Irish history, but for all of human history. The story of the Penal Laws teaches us one clear lesson above all others: Persecution and tyranny anywhere and everywhere are always wrong and must always be opposed. The Story of the Irish Race by Seumas MacManus, 1921, 1975. Devin Adair Co. New York; Ireland: A Terrible Beauty by Leon Uris. History of the Penal Laws, Yale University. Penal Laws (Ireland) from Wikipedia. Irish Penal Law from the University of Minnesota Law Library. Library Ireland Article on Penal Laws.